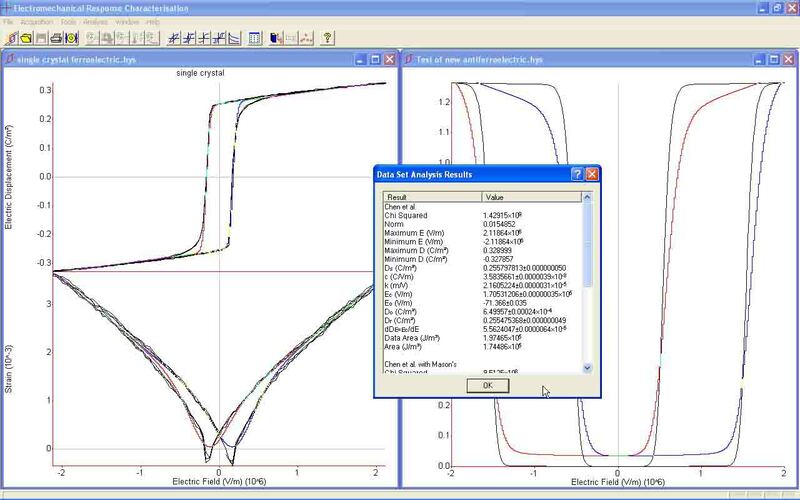 STEP : Electromechanical Response Characterization Program | TASI Technical Software Inc. STEP acquires stress/strain/polarization/displacement curves and determines model parameters for ferroelectric, piezoelectric, electrostrictive and anti-ferroelectric materials. In a general electromechanical response measurement, one of the electrical or mechanical variables is controlled while one of the variables of the opposite variable type is held constant. The remaining electrical and mechanical variables can be measured. As an example, a measurement can be electric field-controlled while the sample is unclamped, meaning stress is fixed at zero. It is not physically possible to simultaneously control both variables of a measurement type. The curves of measured electromechanical response characterize four fundamental kinds of active materials; piezoelectric, electrostrictive, ferroelectric, and antiferroelectric. STEP includes the Piezoelectric Module, Ferroelectric Module, Electrostrictive Module, and the Antiferroelectric Module that provide a variety of common emperical models that can be applied to measured electromechanical response data. The Basic Data Acquisition Module allows data sets to be acquired directly from a variety of instruments under a variety of measurement conditions. The instrument drivers for direct control of instrumentation are integrated into the STEP data acquisition module. After the analysis of any data set, STEP uses determined model parameters to generate a fit over the analyzed data set. Conversely, any set of model parameters can be used to generate a theoretical data set. Aside from the visual confirmation of analysis provided by the fitted data set, a norm parameter is generated as an estimate of the 'goodness-of-fit'. Analysis with STEP is enhanced with the STEP Compound file. The Compound file allows one or more related data sets to be brought together in one document. This allows collective analysis of the data sets to be performed. Types of analysis include determining the dependence of a model parameter on a measurement or process variable (such as coercive field of a ferroelectric as a function of time or temperature). Study the dependence of model parameters or results on aspect ratio, geometry, density, etc. The curves of electromechanical response are characteristic of the material being measured. All curves may exhibit hysteresis. The piezoelectric analysis module of STEP supports the Rayleigh models of piezoelectricity. In all models, it is assumed that the fixed data type of the measurement is zero. The linear coefficients determined depend on the x and y-axis data types to which the models are applied, and the directions assigned to the electric field, electric displacement, strain and stress applied to and measured from the sample. The following table lists the various forms of the piezoelectric equations and standard boundary conditions used to isolate linear relationships. This analysis module provides STEP with common models applied to ferroelectric materials. It is one of the four modules included with the Basic STEP Package. The models available for a given set of data depend on the variable plotted on the x-axis. Some models can be fitted in a modified form to account for hysteresis. In most cases this is done by fitting the original form of the model to the average of the top and bottom curves of the data set and fitting a polynomial to the difference between the top and bottom curve. A modified form of Piquette and Forsythe’s model is provided where the top and bottom branches of the hysteresis curve are modelled by shifting the original model with a coercive electric field, Ec. Linked models require dual data sets where the non-linked model is fitted first, and the linked model is fitted to the data using x data points provided by the non-linked model. This analysis module provides STEP with common models applied to electrostrictive materials. It is one of the four modules included with the Basic STEP Package. The models available for a given set of data depend on the variable plotted on the x-axis. Many models can be fitted in a modified form to account for hysteresis. In most cases this is done by fitting the original form of the model to the average of the top and bottom curves of the data set and fitting a polynomial to the difference between the top and bottom curve. This analysis module provides STEP with common models applied to antiferroelectric materials. It is one of the four modules included with the Basic STEP Package. The models available for a given set of data depend on the variable plotted on the x-axis. Currently there is are no demonstration downloads available for STEP. Please contact TASI Technical Software directly to request a demonstration copy of the software. Version 1.1 is a Win32 application for Windows operating systems. STEP includes sets of large signal analysis models for piezoelectric, electrostrictive, ferroelectric, and antiferroelectric materials. Analysis modules add more specific and specialized models of analysis. The Basic Data Acquisition Module of STEP allows the electromechanical response of a sample to be measured using a variety of instruments. In principle, these measurements can be electric field-controlled, electric displacement-controlled, stress-controlled, or strain-controlled, depending on the instrumentation available. Additional optional data acquisition modules allow electromechanical response to be measured as a function of time, temperature, etc. A brochure is available download. Please contact TASI Technical Software for additional information about STEP. STEP HV is a collection of hardware components that can be used to acquire STEP data sets. This includes an enclosure, a Sawyer-Tower circuit, HV protection electronics, A/D, D/A converter, and a micrometer assembly to hold and adjust a DVRT for displacement measurements. Copyright © 2000-2018 TASI Technical Software Inc. All rights reserved.